PAPA ROBBIE.NET: Amy...GO BACK TO REHAB!!!! LONDON (AFP) - Troubled soul singer Amy Winehouse kicked off her 17-date tour with a shambolic performance that saw fuming fans booing and marching out, reports said Thursday. The concert at the National Indoor Arena in Birmingham, was a chance for the 24-year-old to get back to singing and put her woes behind her. Winehouse has had "health issues" -- widely reported to be drug and alcohol abuse -- and her party-loving husband Blake Fielder-Civil is being held on grievous bodily harm and conspiracy to pervert the course of justice charges. But Wednesday's gig at the NIA, which can hold up to 13,000 people, was slammed by angry fans as a "disgrace" after she turned up late and stumbled about the stage. When punters started jeering, Winehouse snapped: "Let me tell you something. First of all, if you're booing, you're a mug for buying a ticket. "Second, to all those booing, just wait till my husband gets out of incarceration -- and I mean that." The Birmingham Mail newspaper's music critic Andy Coleman said it was "one of the saddest nights of my life". "I saw a supremely talented artist reduced to tears, stumbling around the stage and, unforgivably, swearing at the audience," he wrote. James Dyas demanded his money back, according to London's Evening Standard newspaper. "She came on stage half an hour late. She managed four songs but was slurring her words and swaying all over the place," he said. "She fell into the guitar stand and dropped the microphone -- it was atrocious. The song dedicated to her husband was so bad it was like swinging a cat round your head." An, from Birmingham, commented on The Times newspaper's website: "Her singing was awful, out of tune and slurred. She sang for around 50 minutes -- drinking throughout. "I have never seen so many people leave a show. 'Valerie' was my favourite song -- she massacred it!" Pete Massera, from north-west England, added: "It was an absolutely atrocious gig. I, like many others in the audience, got our coats and left before she even finished the set." Gary Atwell, from nearby Rugby, said "streams" of fans walked out, according to the BBC website. "I went out for a sneaky cigarette half way through and at least 40 people left, just in that five minutes," he said. "Valerie", the closing number, descended into chaos when Winehouse stopped singing, dropped the microphone and walked off stage. 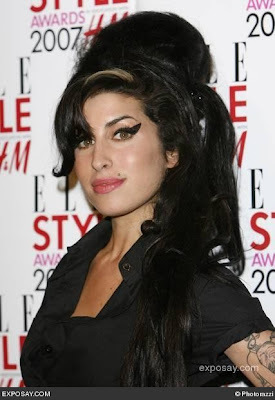 Winehouse, named best British female solo artist at the Brit Awards in February, has rarely been out of the newspapers in recent months due to her lifestyle issues.